Pesticides accumulate in bodies with high fat content. This conclusion has been reported by scientists from the Far Eastern Federal University (FEFU), who have been studying seabirds and marine mammals of the Sea of Okhotsk and the Bering Sea for several years. In a scientific article published in Marine Pollution Bulletin, the authors, led by Vasiliy Tsygankov, head of Laboratory of Environmental Biotechnology, presented the results of a study of organochlorine pesticide (OCP) build-up in the bodies of seabirds and marine mammals living in the north-western part of the Pacific Ocean. OCP are synthetic pesticides that are derived from chlorocarbon. They are widely used in the chemical industry and agriculture. OCP are highly toxic, have a long decay period, and can accumulate in fat tissue and the internal organs of living bodies. Many of these substances, such as DDT (dichlorodiphenyltrichloroethane) and its metabolites are included in the "Dirty Dozen" list developed at the Stockholm Convention. Although pesticides are targeted to damage specific organisms, they often also affect non-target species badly. The scientists concluded that the higher the place of an animal in the food chain, the more toxins accumulate in its body. The study also points out that long-living species accumulate more pesticides than the species that have shorter life cycles. For example, there are low pesticide levels in the bodies of small fishes, but in seabirds, mammals and carnivores that eat such fishes, the levels of OCP concentration are higher. The researchers studied materials collected from the bodies of gray whales, Pacific walruses and seabirds (Northern fulmar, Crested auklet, Auklet-crumb, Pacific gull, and Gray petrel). 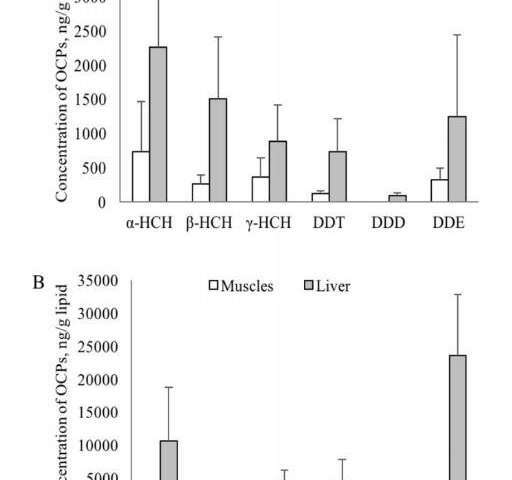 They report generally high levels of OCP concentration in the organs of seabirds and marine animals, and that the level of pollution in the bodies of mammals was higher due to higher fat content. The concentration of OCP in the organs of the mammals from the Bering Sea is lower than in the organs of similar organisms from the other regions of the Pacific Ocean. 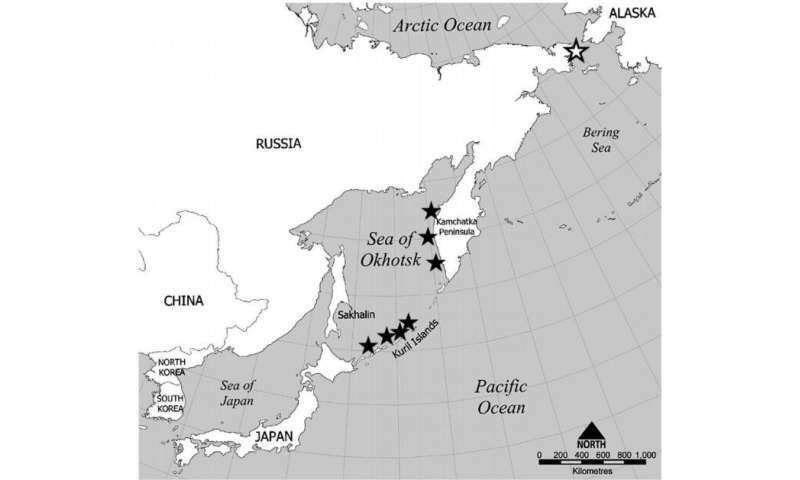 At the same time, having evaluated the status of the ecosystems of the Bering Sea and the Sea of Okhotsk, the team concluded that the levels of pesticide pollution in this area are close to those in other sub-Arctic regions of the World Ocean. The level of OCP accumulation in marine organisms is an important indicator of global environmental status. This parameter is considered in the course of both local and global environment monitoring. By studying OCP concentrations in the bodies of marine organisms with long life cycles, scientists can determine the total level of pesticide pollution in the ocean. On the other hand, studying fish helps them to control local environmental status. Among the sources of pesticide pollution listed by scientists, there are global atmospheric processes, as OCP have been found even in the bodies of the mammals that live in pesticide-free areas. "Organochlorine pesticides are a serious threat for people, and the situation worsens with time. For example, due to the actions of China and India, the concentration of OCP in the Indian Ocean is constantly growing. The USA also produce pesticides for sale," says Kirill Golokhvast, provost for research at FEFU and Doctor of Biology. To study the samples taken from the bodies of seabirds and marine animals, the team used gas chromatography-mass spectrometry (GC/MS). This technology is considered the gold standard in the field of identifying chemical substances in basic and complex mixtures. The samples were homogenized, and lipids were recovered from the end material to be analyzed for the presence of OCP. The samples for the study had been collected for three years, from 2010 to 2013. 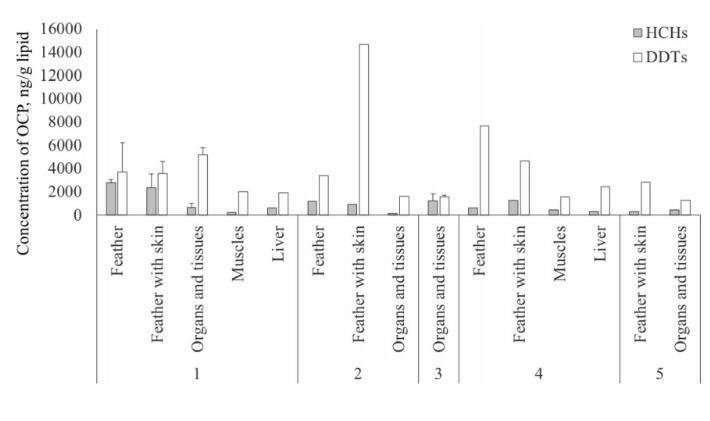 The materials for the analysis included feathers of seabirds, their skin, liver, muscles, and bodies in general, as well as muscles and livers of gray whales and Pacific walruses.